When you call the Quail Hollow Psychotherapy telephone number (360-683-4818), you will reach a confidential voice mail system. Leave a message for Dr. Price anytime, and remember to leave your name and phone numbers. He makes every effort to return telephone calls as soon as possible. He checks his voice mail box frequently. If you are unable to wait for Dr. Price to call you back and are having a mental health emergency, please call 911 or go to the Emergency Department at Olympic Medical Center or your nearest hospital. Note that a 24/7 Community Crisis Line is available by calling 360-452-4500. 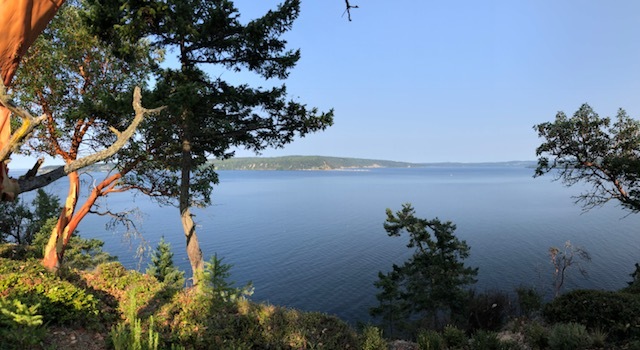 Dr. Price’s office space is in a private portion of his place of residence overlooking beautiful Discovery Bay in Clallam County. Since his psychotherapy office is a "home office," you may be introduced to his “therapy” pet cats. While they are loving, warm, and friendly animals and many patients enjoy seeing them, you might not be an animal person. If this is the case, simply say so and Dr. Price will make sure you are not bothered by their presence. Even if you are an animal lover, you are expected to set limits with them. Dr. Price treats patients in Sequim, Port Angeles, Port Townsend, Olympic Peninsula, Clallam County, Kitsap Peninsula, and Jefferson County in Washington (WA) state. Click for directions to Quail Hollow Psychotherapy or click on "Toggle full-screen" button on top right to see the full map.